This article provides the instructions to configure and register LG webOS devices for Appspace. A LG webOS compatible USB drive. 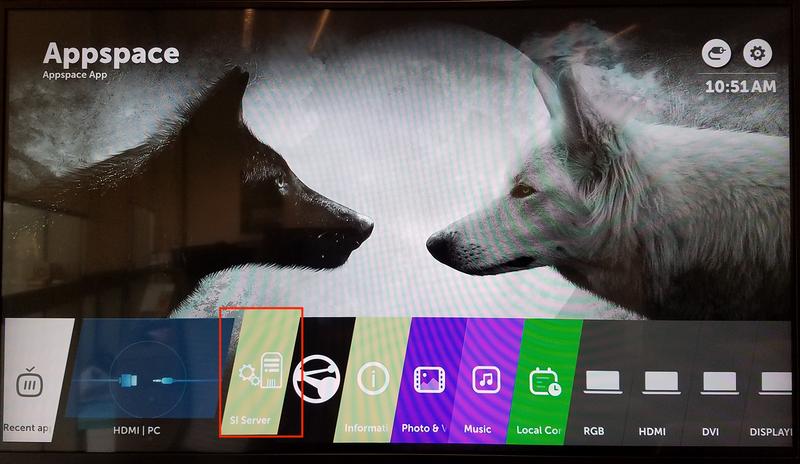 In your Appspace console, navigate to System > Downloads, and download the Appspace App for LG webOS 3.0 (com.lg.app.signage.ipk). Copy the com.lg.app.signage.ipk file to the /application directory on the USB drive. Insert the USB drive into the LG device. Access the SI Server settings panel. 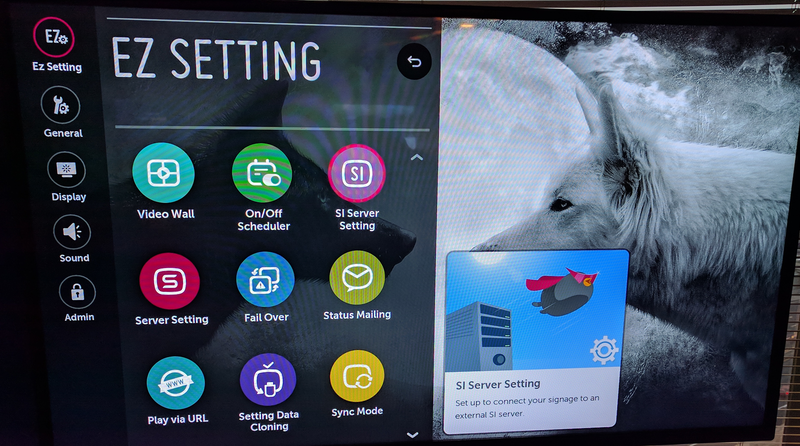 On the LG remote control, press the Home button, and select SI Server from the app tiles to access the SERVER settings. If the SI Server tile is not found in the app tiles, you’ll need to access the SERVER settings via a hidden menu. 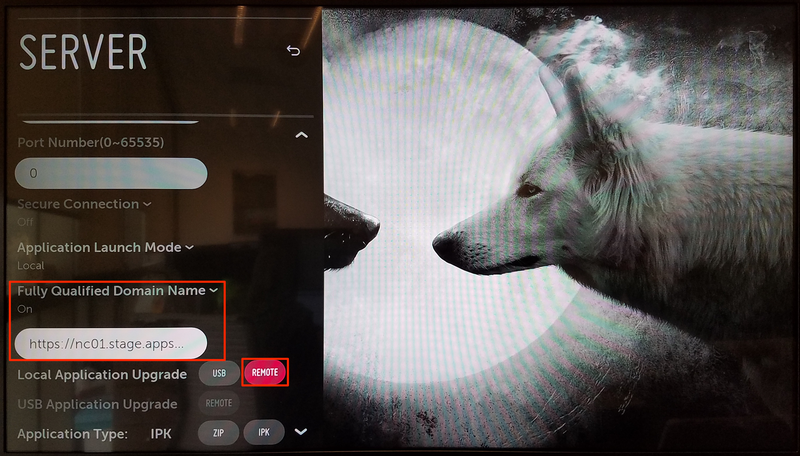 On the LG remote control, hold the Settings button until the chat bubble icon appears. In sequence, press 8, 0, 8, 0, and the OK button to access the SERVER settings. Or, in sequence, press 0, 0, 0, 0, and the OK button to access the CONFIGURATION menu, to enable the SI Server tile on the app tiles. On the LG remote control, press the Settings (Gear icon) button, and select EZ Setting > SI Server Setting to access the SERVER settings. In the SERVER settings panel, select the USB button in the Local Application Upgrade field. Select CONFIRM in the APPLICATION UPGRADE dialog box, and wait for the LG device to install the Appspace App to the device. The device should return to the Home screen once done. Select and launch Appspace App from the Home screen. Appspace App has to be installed on the LG device prior to registering via local policy file. The DHCP, NTP server, Timezone, Proxy server and Custom script fields are only supported on BrightSign devices. For LG devices, please leave this section as is and continue below. Extract the downloaded Autorun.zip file. Within the Autorun folder, locate the policy.json file in the www folder. Copy the policy.json file, and paste the file in the /procentric/scap/application/content/policy/ folder on your USB drive. Launch Appspace App on the LG device. If Appspace App is not launched before inserting the USB drive, Appspace App will use the USB storage, rather than local storage to save files. Insert the USB drive into the LG device, and restart Appspace App. 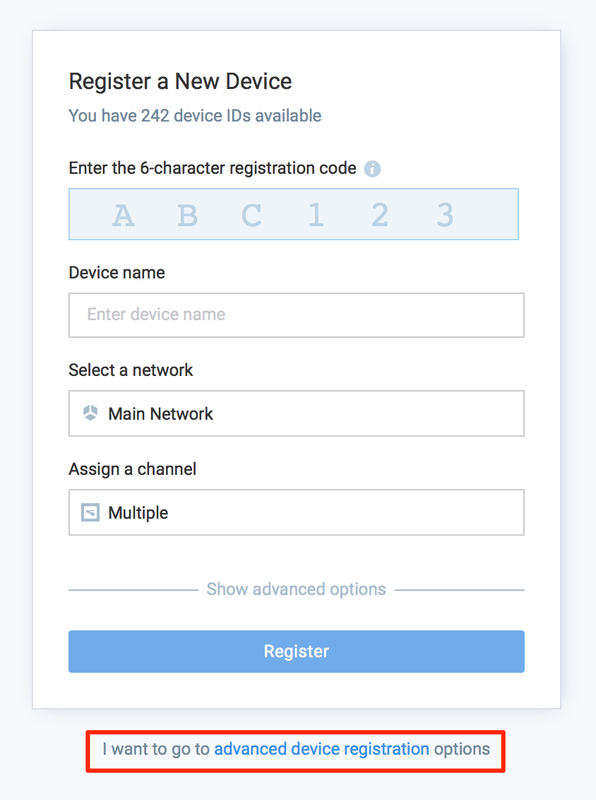 The device will begin registration once Appspace App has restarted. For Appspace on-premises, download the Appspace App for LG webOS 3.0 (com.lg.app.signage.ipk), and upload the package to the Deployments page in the Appspace console. In the SERVER settings panel, enter in the URL to the Appspace App for LG webOS 3.0 in the Fully Qualified Domain Name field. In the Local Application Upgrade field, select the REMOTE button.